A couple of monthes ago, I had the opportunity review a beautiful bracelet made by Sonya of Belly Charms (my review can be read here). In addition to the beautiful jewelery that she produces, Sonya also sells Vital ID bracelets. Sonya offered to send me one of these bracelets to review as well as offering a bracelet to one of our readers! In my mind, one aspect of health and wellness for my family is knowingÂ that my girls are safe! Having a bracelet that contains all theÂ information needed if one of my girls were to be lost or hurt isÂ really important to me. Sonya’s Vital ID bracelets site has different products that all relate to providing vital information when needed. She sells MEDICAL VITAL ID WRISTBANDS and SPORT ID PRODUCTS that are suitable for all ages, KID’S SAFETY ID WRISTBANDS and KID’SÂ TRAVEL ID BRACELETS that are designed for children and PET ID TAGS FORÂ DOGS that are perfect for pets! I received a Kid’s Safety Vital ID Wristband in Pink I was impressed because I thought my girls would want to wear it because it was actually pretty! I found the card big enough to fill in all the details I wanted to include but not so large that it was bulky. It was also really sturdy and is waterproof so it should be easy to clean (I haven’t had to clean it yet but I think it will not be a problem). Though we haven’t used it in the pool yet, I also appreciate the fact that it is 100% waterproof so when we go on holiday, it can be worn in the pool with no problems! I also like the fact that there is an extra ID card included – I put information about each of the girls on them which means I can actually interchange theÂ information depending on which girl is wearing it. 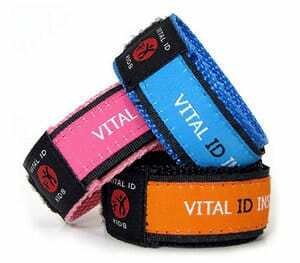 With summer holidays fast approaching, I think we will be using the Vital ID bracelet a lot! .-= Jessie H´s last blog ..Scrubbing Bubbles EXTEND-A-CLEAN Power Sprayer Review & Coupon Giveaway! =-. .-= Anna´s last blog ..Confessions of a shopaholic XD =-. I like the Medical Vital ID Wristband, and it’s very affordable! .-= Brittney A´s last blog ..Josh’s New Toy =-. The travel pack would be great! .-= Tania´s last blog ..Celebrate with me and WIN!!! =-. I love the blue Kid’s Safety Id Band. My oldest is not a wanderer but my 4 year old is. These are completely cool! I love the colors & the fact that they are easy to get off & on. I may need to get one for each of my kids, especially with summer coming & all the things we’ll be out doing. I like the kids vital id bracelets because I like how the info is discreetly hidden so it has to be looked for and not that some random stranger standing near my kid can see their name and info. I like the medical id bracelet due to allergies. I like the KID’S SAFETY ID WRISTBAND because they’re latex free and waterproof always a plus with kids!